GW’s Office of the Vice President of Research (OVPR) has selected Dr. Lijie “Grace” Zhang (MAE) to receive the 2018 Early Career Researcher Award. She will be honored, along with winners of the other 2018 OVPR Faculty Research Awards, at the 8th Annual Faculty Honors Ceremony, which will be held Wednesday, April 25 at 4:00 pm in the Jack Morton Auditorium. Dr. Howie Huang (ECE) has received a $150,000 research grant from Raytheon. This grant will continue to support his research on developing machine learning algorithms and high-performance computing systems for the applications in cognitive radio and signal processing. TRT World (Turkish Radio & Television Corporation) interviewed Dr. Kim Roddis (CEE) on March 16. Dr. Roddis addressed the topic of the pedestrian bridge collapse at Florida International University. Dr. Ken Chong (MAE) has published the following journal paper: Q. Geng, S. Zhu, and K. P. Chong. “Issues in design of one-dimensional metamaterials for seismic protection,” Soil Dynamics and Earthquake Engineering, Vol. 107, April 2018, pp. 264-278. Dr. Ashraf Imam (MAE) has co-authored a paper with his colleague, Francis H. “Sam” Froes: F. H. Froes and A. Imam. “Titanium: A Historic and Current Perspective—Part I,” Advanced Materials & Processes, February/March 2018 issue. This paper is being published in two parts; the second part will be published in April 2018. Dr. Michael Keidar (MAE) and his graduate student Eda Gjika and undergraduate student Megan Kirschner have published the following paper: E. Gjika, S. Pal-Ghosh, A. Tang, M. Kirschner, G. Tadvalkar, J. Canady, M. A. Stepp, and M. Keidar. “Adaptation of Operational Parameters of Cold Atmospheric Plasma for in Vitro Treatment of Cancer Cells,” Applied Materials & Interfaces. doi: 10.1021/acsami.7b18653. Dr. Lorena Barba (MAE) is a member of the National Academies of Sciences, Engineering, and Medicine (NASEM) Study Committee on “Best Practices for a Future Open Code Policy for NASA Space Science.” She participated in the third meeting of the study committee, held February 26–28 in the National Academy of Science Beckman Center, Santa Ana, CA. Deputy Secretary of Energy Dan Brouillet addresses the symposium. 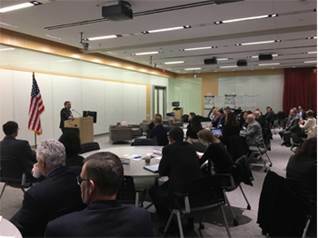 On March 8-9, SEAS hosted the symposium “Enabling Advanced Reactors for the Market,” which brought together academic researchers, national laboratory scientists, developers, energy producers, industrial users, the government, and other organizations to assess the success of advanced reactors with the assurance of sustainable and secure energy. The symposium highlighted the evolution of the energy market and future industrial energy needs, potential applications of new nuclear energy technologies, and public policies and how they can be shaped to support the success of advanced reactors to meet future energy needs. Dr. Ekundayo Shittu (EMSE) gave a keynote address titled “Energy Investments under Regulatory and Learning Uncertainties.” Among the notable attendees at the symposium were Deputy Secretary of Energy Dan Brouillet; Under Secretary of Energy Mark Menezes; the principal deputy assistant secretary for the Office of Nuclear Energy, Edward McGinnis; the president and CEO of the Nuclear Energy Institute, Maria Korsnick; the chairman of the U.S. Nuclear Regulatory Commission, Kristine Svinicki; and several national laboratory directors. Dean David Dolling provided the welcome address and Dr. Tom Mazzuchi (EMSE) provided support on multiple fronts. The EMSE department, the dean’s office, and the SEAS Computing Facility were of invaluable assistance to the success of the symposium. The symposium was coordinated by SEAS, the Department of Energy's Gateway for Accelerated Innovation in Nuclear (GAIN) Initiative, the Nuclear Energy Institute, and the Electric Power Research Institute. Dr. Guru Prasadh Venkataramani (ECE) and Dr. Milos Doroslovacki (ECE), along with ECE Ph.D. student Fan Yao, presented their work at the 24th IEEE International Symposium on High Performance Computer Architecture (HPCA), held February 24-28 in Vienna, Austria. Their paper—“Are Coherence Protocol States Vulnerable to Information Leakage?”—presents novel insights on how cache coherence protocols could be vulnerable to timing channels, along with ways to mitigate them. These timing channel attacks have received recent widespread attention through meltdown/spectre. HPCA is a premier forum for computer architecture researchers and attracts widespread participation from the semiconductor industry. Dr. Venkataramani also served as a session chair for papers that discussed power optimization. Dr. Tim Wood (CS) was invited to give talks at Brown University in Providence, RI, and BBN Technologies in Cambridge, MA, on March 9 and 12. He presented his research group’s work to build more efficient and flexible, software-based network infrastructures. Dr. Joe Cascio (EMSE) recently served as a judge for the Department of Defense Secretary of Defense Environmental Awards, which honor individuals, teams, and installations for their continued commitment to protecting irreplaceable resources and ensuring the availability of land, water, and airspace necessary to sustain military readiness. The awards recognize efforts to ensure mission accomplishment and the protection of human health in the areas of environmental planning, waste management, and compliance with environmental laws and regulations. Dr. Howie Huang (ECE) has been selected to join the editorial board of IEEE Transactions on Cloud Computing. He began his duties as an associate editor on March 1. Mr. Patrick Kelly (adjunct faculty, CS) has been selected as the permanent director of critical infrastructure policy at the U.S. Department of the Treasury’s Office of the Comptroller of the Currency. The IEEE Power and Energy Society (PES) has selected two ECE graduate students, Ali Alawad and Mohamed Abushama, to attend the IEEE PES Transmission & Distribution (T&D) Conference & Exposition and to present their posters in the conference poster session. Ali and Mohamed also will receive housing support for the conference. The conference will be held April 16-19 in Denver, CO. The IEEE PES T&D Conference & Exposition is one of the most important and largest conferences organized by IEEE, with more than 10-15,000 attendees from industry and academia. Ali and Mohamed were nominated for the conference by Dr. Payman Dehghanian (ECE). The National Academy of Inventors has selected BME postdoctoral researcher Aleks Klimas to participate in the 2018 Student Innovation Showcase at its Seventh Annual NAI Conference, to be held here in Washington, D.C. Dr. Klimas is one of the only six finalists for this honor. The OptoDyCE project, developed by Aleks under the guidance of Dr. Emilia Entcheva (BME), will be exhibited and presented on April 6 at the conference. Ms. Carolynn Lodge has joined the SEAS Development Team as the new assistant director of donor relations. In this role, Carolynn will be integral to coordinating events, liaising with the SEAS National Advisory Council, and overseeing data projects that help SEAS thoughtfully engage the SEAS alumni community. Carolynn began working at GW in 2016 as an administrative associate with the Planned Giving Department; her role subsequently expanded to include working with the Family Philanthropy and Advancement services teams. Prior to joining GW, Carolynn was at Johns Hopkins University working for eight years in a variety of roles, including as both a budget assistant and administrative secretary for the Department of Epidemiology, and as an administrative coordinator in the Whiting School of Engineering’s dean’s office. In her spare time, Carolynn enjoys teaching first-year English composition courses at Towson University, Howard Community College, and Baltimore Community College. Carolynn holds a Bachelor of Arts degree from Bowie State University in English and modern languages, with a concentration in African-American literature, and a Master of Arts degree in professional writing from Towson University. Faculty will cover topics such as: the different types of available academic positions for PhDs, how to write a teaching and research statement and cover letter, the process of faculty interviews/“dos and don’ts”, negotiating salaries, and more. Please come with any additional questions for Q&A! Masters students are also welcome. George Hacks is a new student-led, 24-hour innovation competition at GW that is open to students from for all majors and is breaking from traditional hackathons meant for computer science majors. Pitches will address needs for patients battling cancer, medical and social innovation solutions for the aging community, and more! 100 participants will participate in teams of four that will compete for prizes! Please email [email protected] to receive registration information, to apply to be part of the student organization next year, or to volunteer for our inaugural event in March. For additional information, visit the georgehacks.org website. This event is sponsored by SEAS and GW's Office of Innovation and Entrepreneurship. Register for an opportunity to have dinner with a SEAS alum! Dr. Graves worked for NASA for 26 years, has been CEO or chairman of the board of several startup companies, and has been a member of the National Advisory Council at SEAS for 20 years. This dinner is open to juniors, seniors, and masters students.